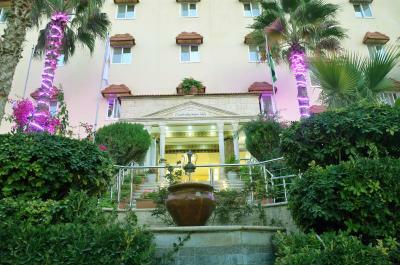 Brilliant location close to the entrance of Petra.and All the staff were very friendly and helpful. 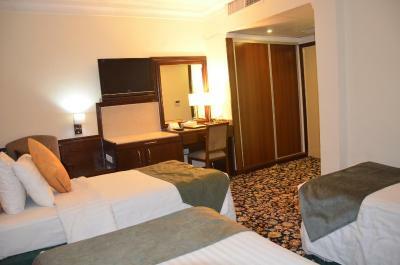 Rooms were great. 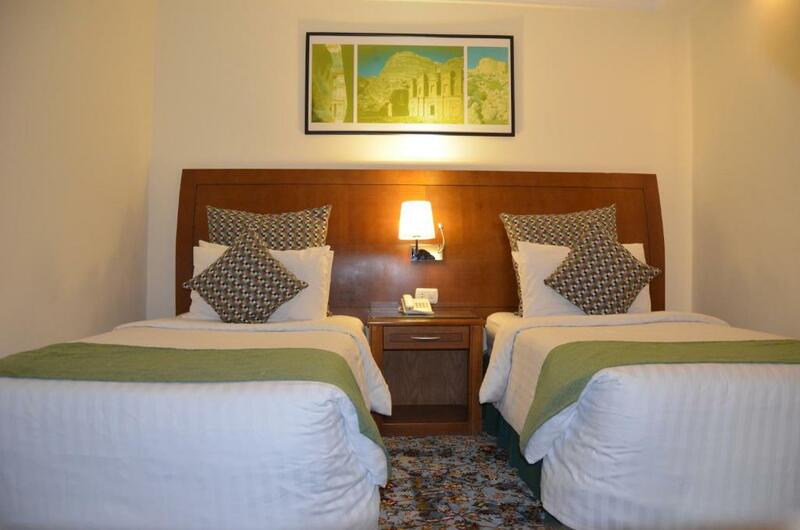 Location is good and it’s easy to find however is better for you to rent a car and drive there, then drive from the hotel to the Petra entrance and just pay 2 JD for all day parking, otherwise the walk on the way back is hard because is uphill. Nothing fancy but useful since you are gonna be outdoors all day long while in Petra. 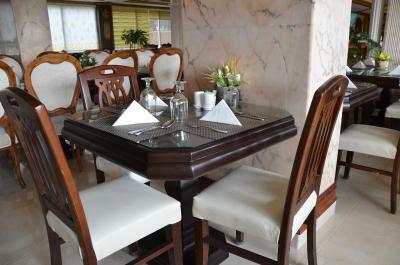 Nice breakfast buffet, all you need to start the morning is there. The Filipino ladies from the staff are great and very welcoming/helpful. I liked the lobby decor, very nice. Beds were very comfortable. The bed was quite comfortable. Breakfast had a good selection. The rooms were a nice size. There was a nice size parking lot right out back. Staff is super nice and breakfast was very delicious with so many different options. 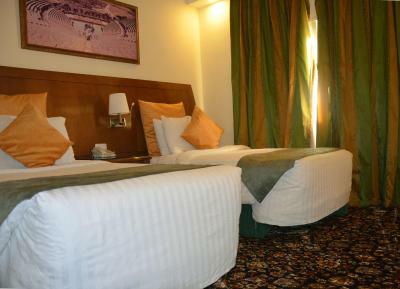 Free parking and the room itself has everything you need. We travelled to Petra via local bus, the driver ensured we knew where to go & dropped us right outside the door. 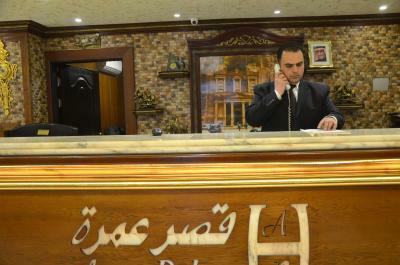 The hotel staff were very accommodating & more than willing to provide us with information to ensure we enjoyed our stay. The restaurant food was delicious - we had both dinner & breakfast. We enjoyed the swimming pool & spa at the end of our huge massive walk through Petra to the Monastery during our stay. 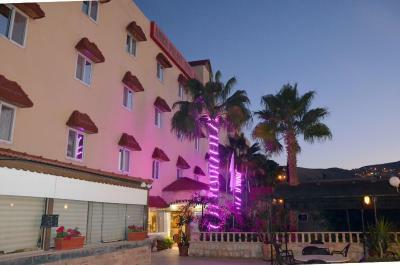 Located very close to town & the entrance of Petra. 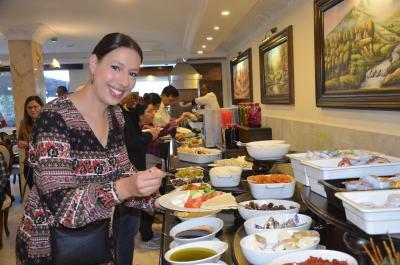 Jordanians are very beautiful people, kind hearts & beautiful spirits. 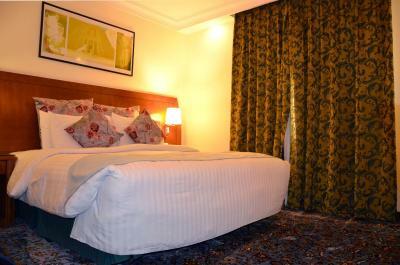 Nice hotel with luxurious rooms. 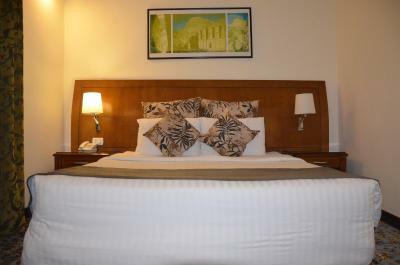 Amazing bed, which is highly welcome after exploring Petra. Very decent breakfast with wide choice. 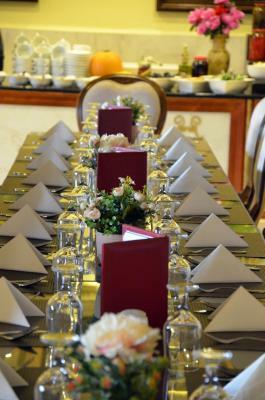 Staff at the reception do their best to make your stay comfortable. The staff was just amazing. Extremely friendly and helpful. I had dinner one night in the hotel - after walking up to the monastery in Petra my feet needed a break. 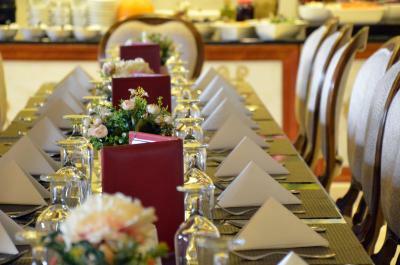 I was the only guest who stayed for dinner but The chef prepared a delicious three course dinner for me. I had a spacious room with a view. Great bed with a lot of pillows and a bathtub in the bathroom. 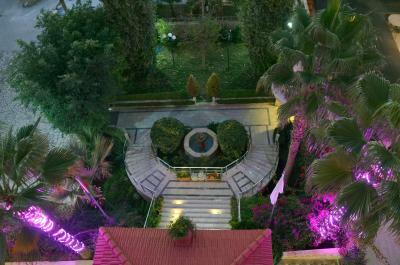 You can sit on the terrace and enjoy the view. There is hardly any traffic ( compared to Amman) and it was possible to sleep. 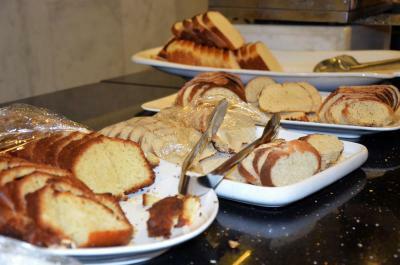 Breakfast from 0630 - possible to enjoy it before you go to Petra. 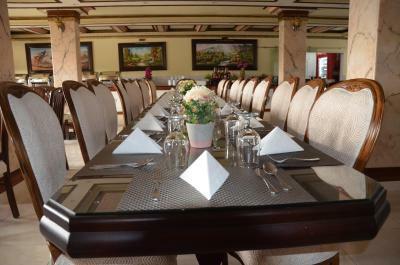 Amra Palace International Hotel This rating is a reflection of how the property compares to the industry standard when it comes to price, facilities and services available. It's based on a self-evaluation by the property. Use this rating to help choose your stay! 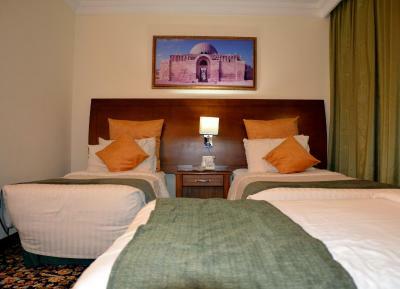 In Petra next to the Wadi Musa Souk, this hotel offers panoramic views of the Petra Mountains. It has a spa with indoor heated pool surrounded by lounge chairs. 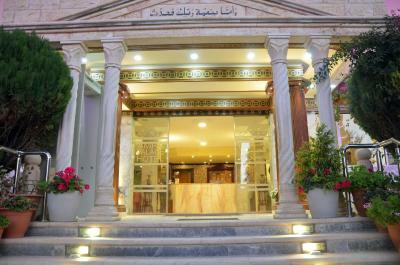 The Hotel is within a walking distance from the Petra Gate. 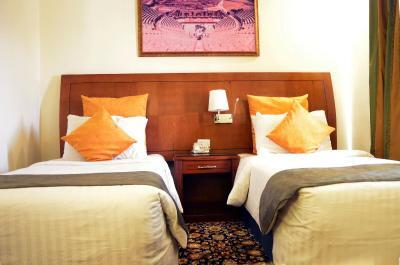 All rooms at the Amra Palace International Hotel are decorated in warm colors. 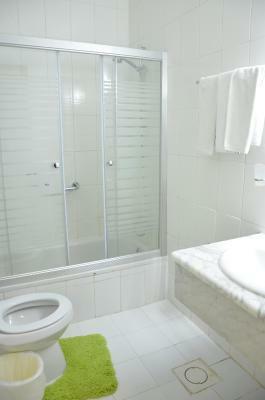 They offer flat-screen TVs with satellite channels, a minibar and a private bathroom with a hairdryer. 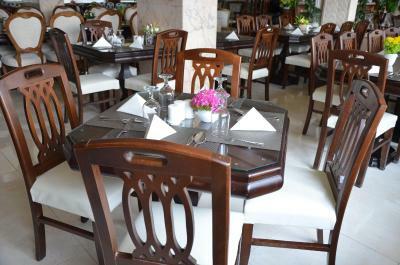 Each morning a breakfast buffet is served in Hotel Amra’s dining room. 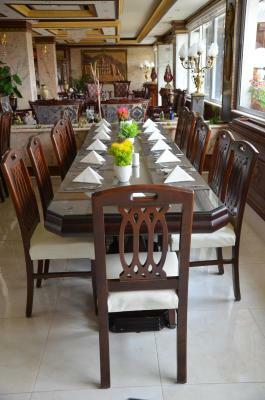 In the evening, the restaurant serves a wide variety of Arabic and international cuisine. 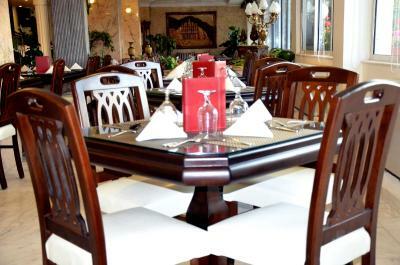 In the summertime, the hotel offers an outdoor Bedouin Restaurant, which serves a traditional barbecue. 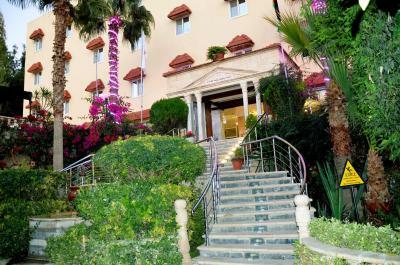 Amra Palace Hotel is just minutes from the main shopping areas and the entrance to the ancient city of Petra. Free on-site private parking is available. 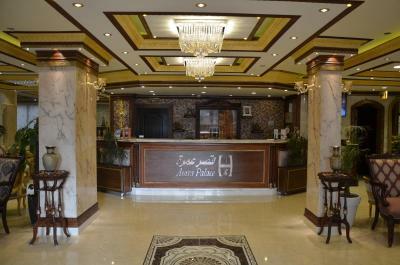 When would you like to stay at Amra Palace International Hotel? 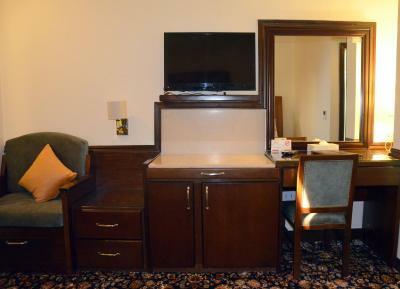 This air-conditioned room has a satellite TV, a minibar and a safe. 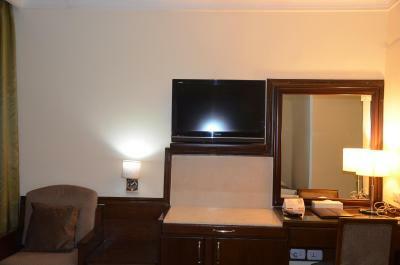 Spacious room that has a satellite TV, a minibar and a safe. 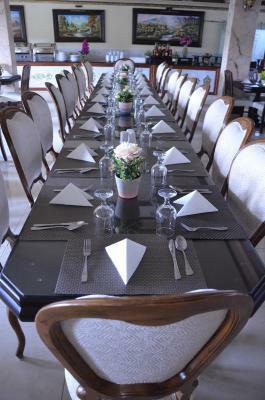 House Rules Amra Palace International Hotel takes special requests – add in the next step! One older child or adult is charged JOD 25 per person per night in an extra bed. 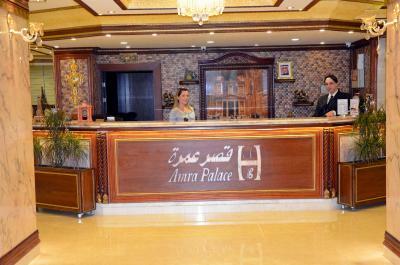 Amra Palace International Hotel accepts these cards and reserves the right to temporarily hold an amount prior to arrival. They are currently doing renovations which were loud and in the hallways. 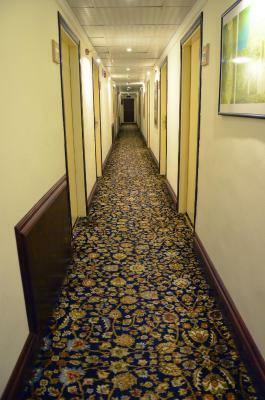 The carpet floor in our room was a bit dusty/sandy from the Petra visits of the people before us. 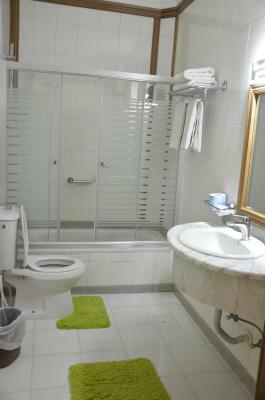 Tiles in de rooms would have been nice in that regard. 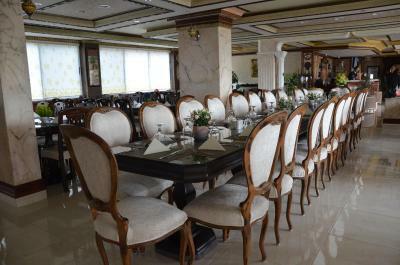 We ate one night in the hotel restaurant when there was no buffet and we thought the quality of the food was very low. 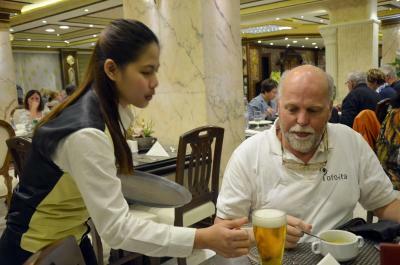 There are plenty of restaurants nearby that serve higher quality food at the same or lower prices. The pool area needs a loving hand. The pool was quite cold and dirty and the jacuzzi was extremely hot (too hot to even go in). The only things that could have been better were the breakfast buffet didn't have much fresh juice, but there was a large selection of food, so that was great. The only other issue we had was that despite paying the total bill in advance through booking.com, when we checked out the staff didn't seem to understand that aspect of the system and insisted that my credit card had only held the reservation, so I had to pay again. However, they were still very friendly when we were trying to figure it out and it seemed like a genuine mistake. I was able to get my money back when I contacted booking.com on my return home, so it was all ok in the end, just a little annoying at the time. The hotel was really nice and the staff very friendly. The room was very nice and clean and the beds really comfy - had a great sleep! We were only staying for one night and didn't bring swim suits but wish we had because the pool looked great! It was a short walk to the roundabout where there were lots of cafes and restaurants and had a nice dinner there. The hotel had a shuttle to Petra in the morning so it was really easy to get there. I would definitely come back and stay here again. Food was ok. Not great. Pool is not heated so not useable as so cold. The Hot tub was lovely Day 1 but quite dirty the 2nd day. Upon checking in our toilet didn't work (told staff) never fixed, no working TV and no towels (said laundry machine broke). They moved us to a new room and we woke early to see a full moon at Petra only to be parked in. Told front desk and he said he would try to find who's car it was. When I asked how we could be parked in he responded that it wasn't his car. Found the owner only to have his battery dead. So after all this I had to help push his car out of the way. 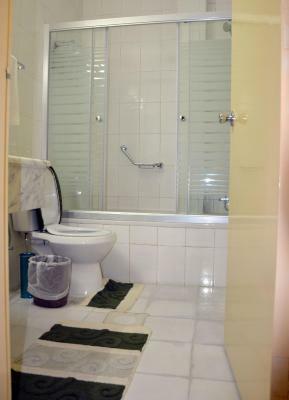 Pictures on booking.com not the same as the room. Mold in tub and shower and after being told laundry was broke I wonder about the sheets on the bed. 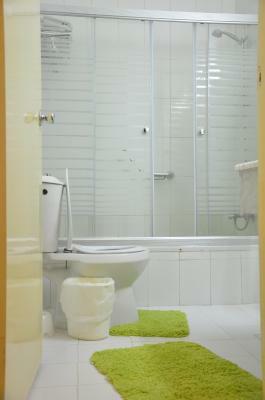 Configuration of bathroom had me sitting on the toilet to was my hands. From my experience I wouldn't recommend this hotel to anyone, even an enemy. Petra is great, but select the another hotel.